Have you seen a wreath made entirely from Christmas tree ornaments? Here's how to make one! I've been wanting to make an ornament wreath for a long time. I even scoured thrift stores for fun ornaments for it. I had everything ready, but I only got the time to try it out yesterday. It took some trial and error, not to mention paper thin glass shards from a shattering glass ornament, but I am very happy with how it turned out. It wasn't actually all that hard to make, although it took a while. If you want to make one it'll probably be much faster that mine was, since I'm hoping to save you some of the error parts from the experiment. 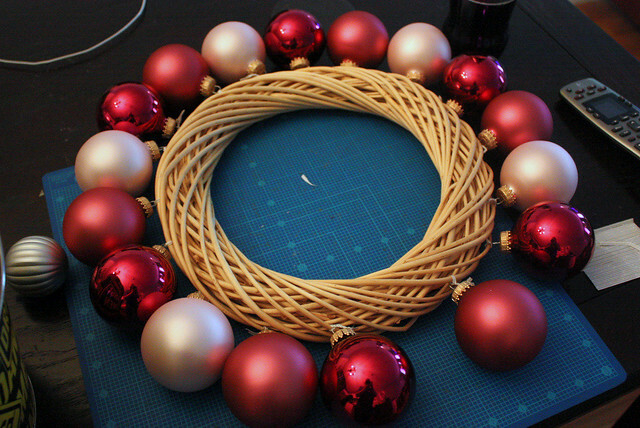 To make this you'll need a wicker wreath form, ornaments, ribbon, super glue and twist ties. 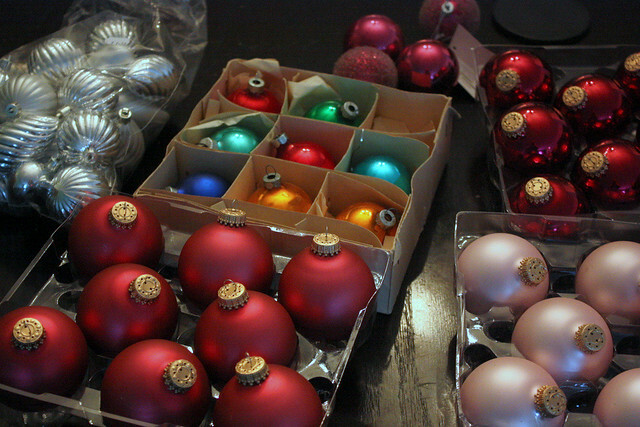 Make sure you have plenty of ornaments, I ended up using about 60 and I could've easily fit more of them. Before you do anything else, check that the ornaments are securely attached to the loops on top! I can't emphasize this enough. 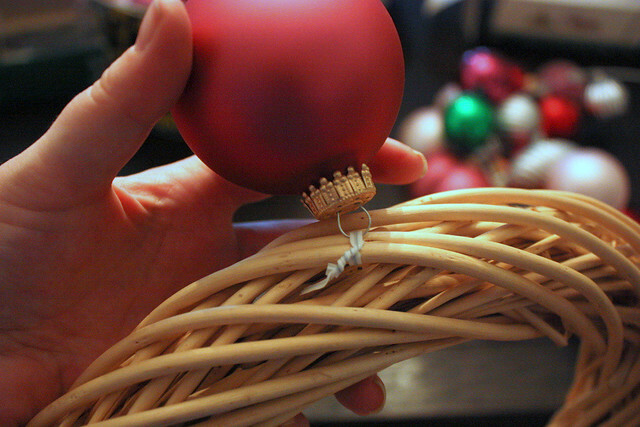 If you're using vintage ornaments, the wires which they are supposed to be hung from are most likely very loose. Use a few drops of superglue under each hangy-thingy (that's the official term) to make sure they are secure. Trust me, it'll be worth it. If you want to make this and don't really care what material the ornaments are, go with plastic. Seriously, they are much more secure for the purpose and won't shatter even if you drop them! I was originally going to build my wreath on a wire hanger (obviously twisted into a circle) but it didn't really work out the way I wanted. First, I would've needed a whole lot more ornaments and somehow they just didn't seem to settle nicely. I understand that if I'd had a ton more ornaments, this would've probably been the best way. I had this wicker wreath I was planning on using to another project, but decided to try it out after realizing I am not going to be able to finish the wire version. I felt like, although gluing the ornaments onto the the wreath might have been the most convenient, it was not worth the risk. Gluing round shapes to other round shapes is not easy and, most likely, not permanent. Having 60 vintage glass ornaments falling on the floor was not an appealing scenario to me, so I had to come up with something else. Enter twist ties. Turns out it was a great idea! 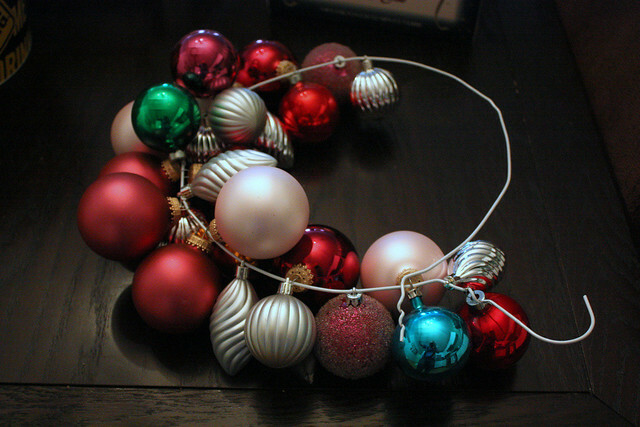 Tie the ornaments on, but leave the ties loose enough so you can move them around. Perfect solution. I started from the outer edges but soon realized I don't actually need to be that organized. Start tying the ornaments on and then just slide them next to each other on the wreath. It's easy even if a bit time consuming. Leave a little bit of the wreath exposed if you want to hang this up, that's where you can tie the ribbon to hang it with. What do you think? Are you going to make one? I'd love to see photos if you end up making one!